ICFF commenced with a bang when Smilow Furniture was a featured local designer at SUITE New York’s Q&A panel discussion, AmericanMade. New York Magazine’s Wendy Goodman moderated the panel, which featured designers and manufacturers Kelly Behun of Neo Laminati, Craig Bassam and Scott Fellows of BassamFellows and Mark Albrecht of Mark Albrecht Studio. As the discussion centered around the trends and strategies inherent in choosing to be American Made, two things became clear; proximity and craftsmanship. Several of the designers including Smilow pointed out the importance of factory proximity to the product development and design process for the designer when producing their hand-crafted products. Judy Smilow also noted that for her family’s furniture line, “American Made has been less about trend strategy and positioning. For Smilow Furniture “American Made” is simply a part of our brand’s DNA.” She also pointed out that Smilow Furniture, known for their enduring Modern classics, have been made in America since 1949 and continue in that same tradition today. The designer’s furniture and products were featured in a special exhibit at SUITE New York during ICFF 2014. Smilow Furniture will continue to be available and on display in SUITE New York’s showroom. Led by Mass 54th soldiers, and the Kent County Middle School drum corps, followed by the festival attendees March to the Memorial Park on High Street in front of the Court House. A prayer by Rev. Clarence Hawkins. 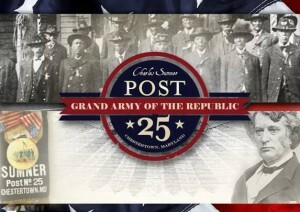 More Information about The Charles Sumner Post #25, Grand Army of the Republic Grand Opening.